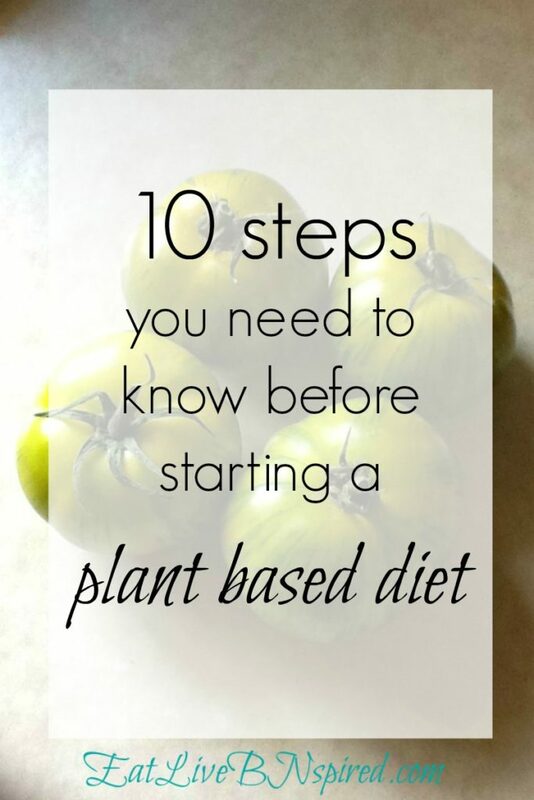 Inside: Start-off with these 10 simple steps before beginning a plant-based diet. 100 + pounds gone! Little did I know, five years ago, the decision to eat a whole food plant based diet would change my life forever! The impact, beyond my imagination. Like rushing water, one after another the flood of questions raced through my mind. At the time, not realizing the most important unasked question. What should I do before starting? Post contains affiliate links, which helps run this website. See my full disclosure here. Consistency feeds permanent change, but it doesn’t happen on it’s own. Tweak, evaluate and review the data. But, first set the foundation. Then focus on the next action to take. Each step lays the groundwork. 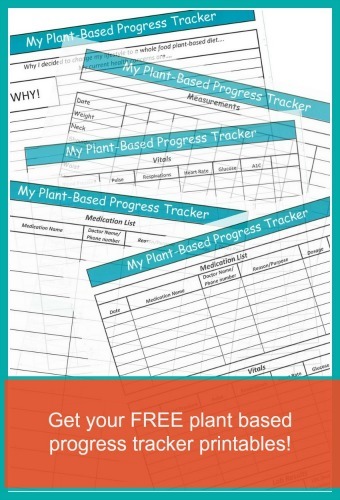 Keep the information in a notebook, journal or use The Plant Based Progress Tracker I created to simplify the process. The most significant step, already taken – deciding to make a change! Always consult your doctor before beginning any health/habit changing program. Changes can happen fast when transitioning to a whole food plant-based diet. Your doctor will need to monitor and/or adjust your medicine as your health improves. Take a picture even if you don’t want to. No one has to see it. Take your own photo, in front of a mirror (selfie) or have someone else take it. Take a front and side view. Along the journey, each month, continue taking pictures of yourself in the same location if possible. So much to see in a photo besides weight loss, a person’s face, a facial expressions, or how they stand. Don’t focus only on the weight-loss. Improve your health from the inside out. Natural weight loss, as a result of a healthy change is a wonderful side effect. The vivid memories are still ingrained in my mind. 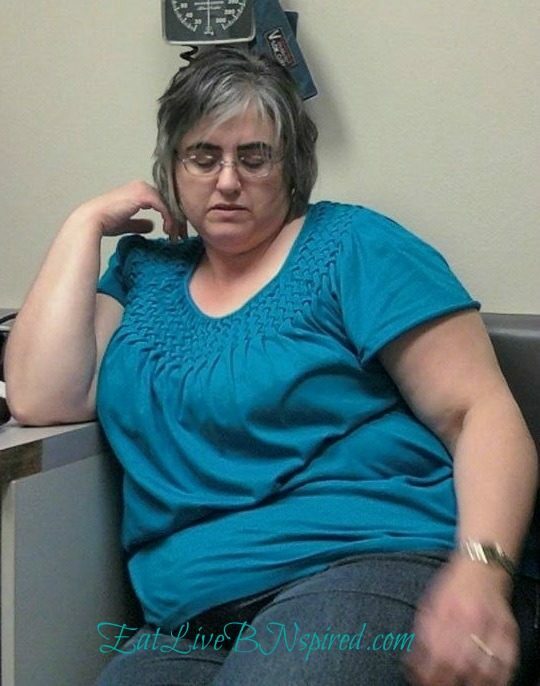 Easter weekend 2012, I wasn’t a happy camper when my husband snapped this picture. Very few pictures exist of me during this time in my life, I preferred avoiding the camera. That year – I decided to make a change. List each medication and/or supplements. The list may be long, short or nothing at all, but write everything down. Good thing my list wasn’t long. Since I wrote everything down later on in my journey. I hadn’t thought about doing this before I started. Grateful it disappeared overtime, instead of growing. 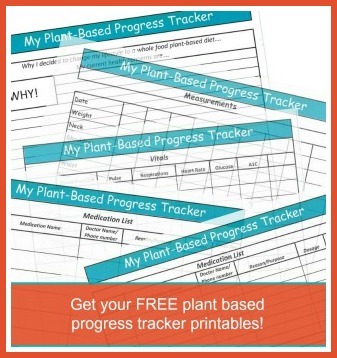 Bonus: The free Plant Based Progress Tracker includes a long and short medication forms. Download your free copy. Write down all health issues you deal with. No matter how small, insignificant they seem, or the length of time you’ve had it. How do your clothes feel? How is your physical or mental state? Add to this list, as you remember other health issues. Even the items which occur on rare occasions. Request a copy of your latest vitals / lab results from your doctor or have them done. Have someone take your body measurements, also write down your starting weight. Check and record your weight only once or twice a month or not at all. Step on the scale at the same time of each day. I prefer morning before breakfast. When the scale affects your attitude, actions or eating habits, throw it out. Otherwise, have it removed from the house or have someone hide it. As the saying goes, “Out of Sight, Out of Mind”. For me, I noticed my weight came off in clumps, instead of gradual. As soon as I thought the scale wasn’t moving, is when it moved. Measurements are a powerful tool, not just the scale. 7. What is your Why! Why did you decide to make the change? Something occurred, either good or bad, that brought you to this point. The decision to change is huge, so write the reason down. Writing down your why will help you through difficult times. I didn’t write my start date down, when I started my journey. In the end, I estimated. Are you waiting for, Monday? What’s so great about Monday? Are people more successful starting on a Monday? Also, Don’t wait for the beginning of the month. And don’t wait to start after an event is over. Events happen all the time. As time passes, you’ll learn to navigate through them. Decide the plant-based meal plan to follow, Dr. McDougall, Forks over Knives or Protective Diet? Each are slightly different, but all are vegan. What’s included in the plan? What excluded? But, most important discover new and exciting foods. It’s hard to navigate and implement, without a plan. One more decision left to make. Will you incorporate a plant based diet slow over time, or jump in now with both feet. Food choices become easier, as the plan is decided and implementation begins. Eliminate future confusion and frustrations. The do’s, don’ts, along with a time frame, increases the success of sustaining a plant-based lifestyle. Now let’s keep it simple, review and select recipes from the plan decided earlier. Pick out a simple breakfast, lunch, dinner and don’t forget the snack. Let’s make it even easier, dinner the night before is the following day’s lunch. Before sitting down to eat dinner, add a portion into a container. Lunch is done! Eliminate the overwhelm that accompanies change to a whole foods plant based diet. Let’s start cooking our way to better health choices! Related: The best list of recipes for switching to a plant-based diet. Nowadays, taking photo’s don’t make me – the unhappy camper. Create a meal plan gather recipes from Pinterest. 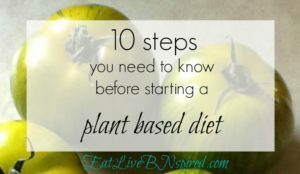 What steps have you taken when beginning your plant based diet? How do you keep track of things? Let me know below in the comment. 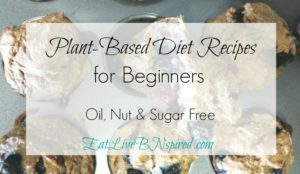 Want more on Starting a Whole Food Plant-Based Diet? This is so helpful!! Thank you for creating this, the shopping list, and the progress trackers! Your welcome! I have plans to add more pages to the progress tracker. Thank you for your generosity of sharing. I am greatful for your caring enough to share your journey, so inspiring. I joined PD and now I need to stop cheating and be real and live the life I am meant to live,in great health. Although I don’t have a huge amount of weight it is the games I play that sabotage any success to get my 15 lbs. off. I now embrace my journey and will use PD and your story to love myself enough to give myself the gift of great health. Great tips to get started and look forward to using a tracker. I’m so glad my journey has inspired you. We all have our own journey and not one is like the other. Don’t get down on yourself. Take it one day at a time. The past is the past. Sit down and decided which recipes you want to have. Make sure to select snacks item or item you can freeze. This will help when you are limited on time. While eating your meal be thankful for the nourishment you are putting into your body. Making this a lifestyle is more than just weight-loss, it’s about health and wellness. I am so glad you are giving yourself the gift of great health! You are on your way! Thank you so much for taking the time to write. I look forward to hearing more about your journey! I’m happy this was helpful. Let me know how it goes. Congratulations on being Vegetarian! Keep it up. I have seen many improve their health by going vegan. You can do it. Just take it one day at a time. I’m so glad this was beneficial. 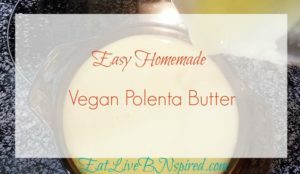 Hello, This is a fantastic quick recipe, thank you for taking the time to write the article for the brilliant blog recipe. Thank you Maria gor thus information, great info for a beginner’s , and thier new life style. Thank you again.